Blabla dolls (and impulse purchasing). Hello Blog-o-sphere. I’ve had a long day, but a good day. Work this morning and an appointment with our Midwife, Kathy, this evening. Everything with mama and baby P are looking great. I can’t believe how fast all of this is going. It feels like our little man will be here in no time. I just happened upon Blabla Kids’ website, and am in love with their knit dolls. 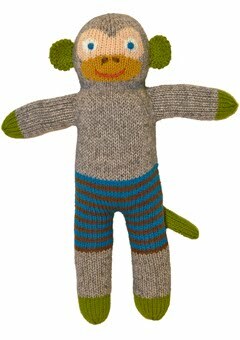 Ever since I found out I was pregnant, I have wanted a sock monkey sort of doll for my little one to be. I found this perfect guy in Blabla’s selection of their classic dolls, and I couldn’t be more in love! So I decided, after much going back and forth, to go ahead and get him. < Previous I’ll do it soon.